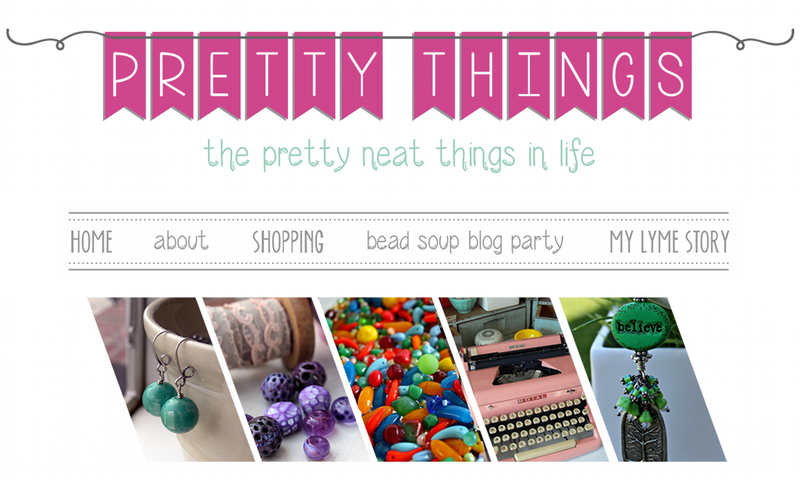 Pretty Things: The Bead Soup Party Has Begun! 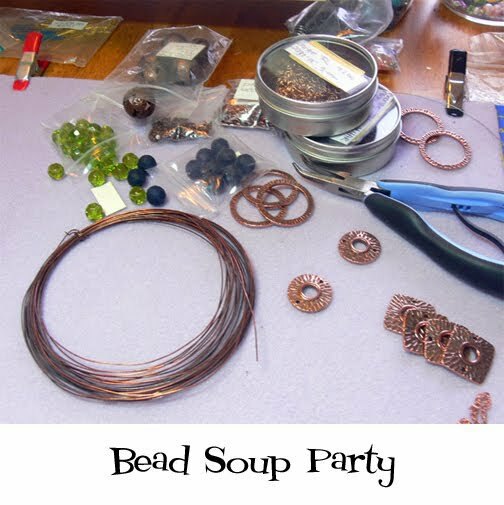 The long-awaited 2nd Bead Soup Party has begun! Today starts a week of blog hops and adventures into the designing lives of a wide variety of jewelry experts from around the world. So without further ado, here's my unveiling, and the reason behind it all. My first reaction was "OMG, I will never, ever be able to make beads as spectacular as these." I mean, LOOK at them! That murrini! That detail! My second reaction was mild panic. These are not the sort of beads that I gravitate towards because I am Miss Funky Pants. I work in bright, bright colors. 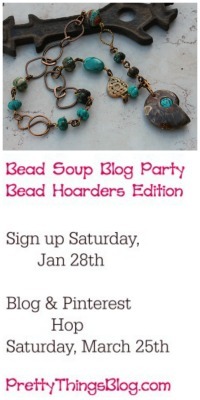 But one of the main reasons for HAVING a Bead Soup Blog Party is to squarely kick oneself outside of the box and push yourself to the limit -- otherwise, really, what's the point? So I set the beads in a pot on the back burner and let them simmer. So there's the one pendant. The other pendant was made simply, with a cascade of yellow and iridescent heliotrope Swarovski crystals dangling beneath. Simple, but with a bead like that, you don't need much! That leaves the gorgeous round beads and the amazing Green Girl Studios owl toggle, which I adore. They just shouted, "Bracelet, bracelet, bracelet, hoot hoot!" So there you have it -- all of my Bead Soup Party Pieces from the lovely Jennifer Cameron's generosity! Please be sure to visit all the blogs that are listed today, and come back to my blog every day until next Saturday to get a new dose of delights! Wow, Lori, You did a fantastic job and I especially love the bracelet which is totally your style! Way to kick off the party. 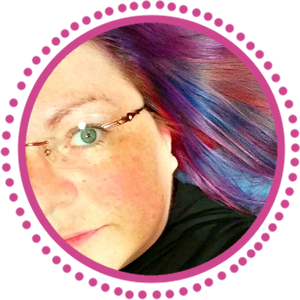 I got up early to get started on the blog hop today, I was so excited! Hi Lori, thanks for getting us all out of our comfort-zones and for linking us to amazing talent. Your pieces are gorgeous! Must go and part on. wow!! you made some wonderful things with your bead soup! Oh Wow! Love the drama of the first necklace! I love all your pieces and I am having a wonderful Sat. morning relaxing and viewing everyone's soup reveals. Thank you from the bottom of my heart for putting this together, You are an incredible person. You are very talented. I love it! Thanks for doing the Bead Soup Party! I absolutely LOVE the wire wrapped stones. The colors are amazing. Congrats on a job well done! Fabulous. I love all of your Soup!!! 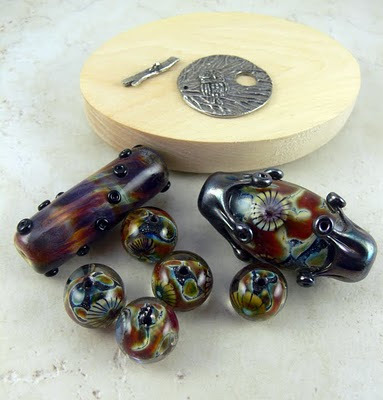 Absolutely BEAUTIFUL, Lori~ every single thing you did is just perfect for those gorgeous lampwork beads. Colors are awesome, finished pieces are awesome, you are awesome! Thanks again so much for hosting another party! Beautiful pieces - love the bracelet! Awesome, your designs do great justice to the wonderful beads you received. Your soup partner will be proud! Love the colors that you have brought together. My favorite - the bracelet. Thank you for organizing the Bead Soup, breaking it up into many days was a great idea. Happy blog hopping! Stunningly beautiful (especially for being so far out of your box ;). I love them all! I love them all but my favourite is the bracelet I WANT THAT :). You are right about the comfort zone thing, participating in these swaps helps to get the creative cobwebs swept out and encourage the growth of new ideas and skills. So thanks again for hosting this great party. What a beautiful necklace and bracelet! Thank you so much for organizing this fun party! Lovely work, as usual, Lori! That bracelet is gorgeous! Both of those pieces are awesome Lori!!! i especially love the crystals that look woven together on the necklace! i cant thank you enough for hosting this swap!!! i have had a blast! Oh, very cool design, Lori! I love the way you wrapped the beads around the wire piece! Very creative! I'm sorry I missed out on the bead soup this time around. :( I certainly want to join in again! But, I'm having fun hopping around to see what everyone did! Great job on another soup! 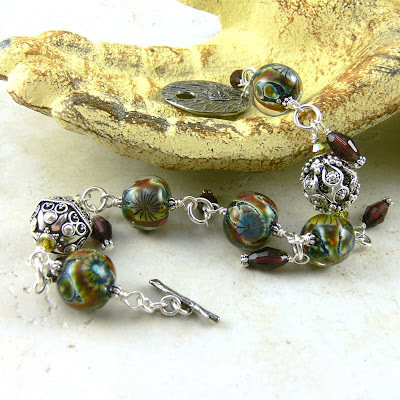 Lori, I just knew you would pull off something pretty with these gorgeous lampwork beads! Just look at these 3 pieces of art jewelry...you sure did your Bead Soup partner proud! 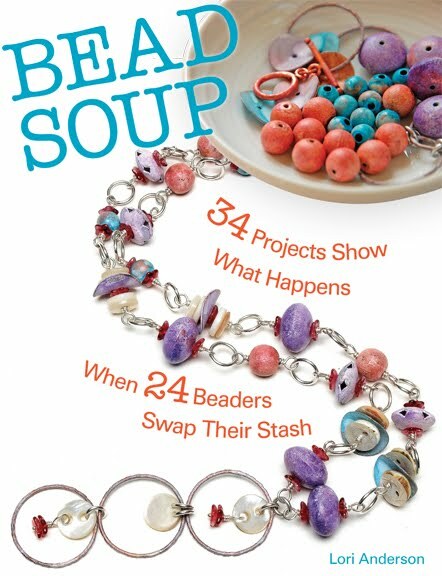 Congrats on the kick-off of another great Bead Soup Party!! WOW that is a beautiful collection you created. Your thought process is interesting to. you did an awesome hi lighting the focal beads. all are beautiful designs. Oh Lori this is so exciting! I just got off of work and have my cuppa and am on a Roll lol! What you did on all of these pcs are just lovely..the necklace blends and has intrest and vibrancy I really like it. The bracelet is awesome! Wow you have done some lovely things with your soup! these are all fabulous, love that wire wrapping on the first necklace..amazing colors..thanks for hosting the 2nd bead soup. I love the way you wrapped the beads. And you used everything, you did good. Oh wow - three pieces. I love all three of them, and actually had sketched down an idea similar to your first one, but decided to do something different.I think they all work really well. Thanks for organizing this fun again. Your piece is so beautiful! Thank you so much for letting me be part of this bead soup, I had so much fun! You did a fabulous job with the beads - just plain gorgeous! Thanks so much for your efforts in pulling this party together. It's been a lot of fun. I've spent some wonderful time checking out all the soupers for today but couldn't leave any comments, tried several times. Everyone has done a great job and I need to kick it to finish by the 25th. Thanks Lori for this great challenge, I'm going to let everyone in the Phoenix East Valley Beaders about the party so they can get in on the next one! Lori, first of all thanks for organizing this party. Your pieces are gorgious and I simply love, love, love the bracelet! Lori~I just got home from a very long day of being outdoors at a fundraiser and am relaxing in the ice cold basement to see what you made. It's been killing me all day, but it wasn't posted before I had to leave this morning. I LOVE what you did with my beads. It isn't very often I get to see them when they grow up and become what they were meant to be. Very very cool! Thanks for organizing the party. This is my first stop and it's been a blast so far! Oh Lori! These are gorgeous! Love that Owl clasp of course!!! Great work! I really love the pieces you had to work with. 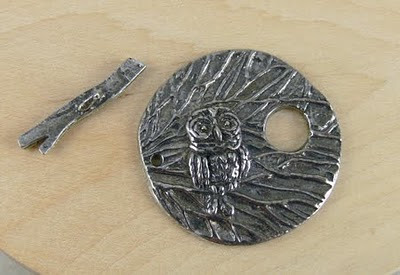 There is something especially fantastic about the owl clasp. I'm so glad you worked it into a bracelet where you can see it. I like the detail work with the first one and what you did with the beads. I'm not sure how it's done, but it's really cool. I really like the bracelet mixed with the silver. It's such a perfect pop of color and combination. Fantastic!! OMG! There are no other words but wowsza! Those pendants are absolutley beautiful and love, love the bracelet! You are the bestest to put on this Party. YOU ROCK GIRL! First off thank you for coordinating this bead swap! Your pieces turned out beautiful. 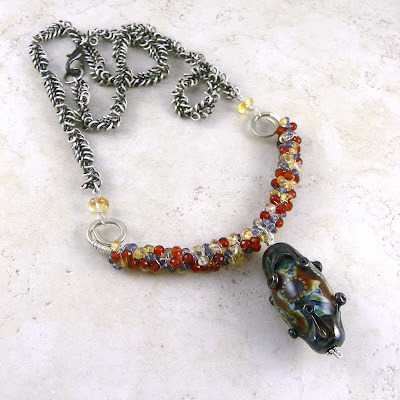 I love the bead wire wrap on the necklace. You have done a beautiful job! The beads you got are gorgeous. Lucky girl! The way you designed the bracelet really highlights the beads. The bracelet is my fav! wowza!! Gorgeous!! You're a fabulous hostess and designer. I'm so happy I got to participate again and I absolutely appreciate all your hard work for organizing all of this for us, you're fabulous miss lori! :) HUGS! Simply amazing! You did such a great job working outside the box and still injecting your own style into each piece -- and I LOVE the bracelet!! I love the way you brought out the definition of the focal beads and stayed true to them at the same time! Lovely work. Lori--you did an amazing job with those beads! I love the Bead Parties-because like you said--It's supposed to kick you out of your usual box! 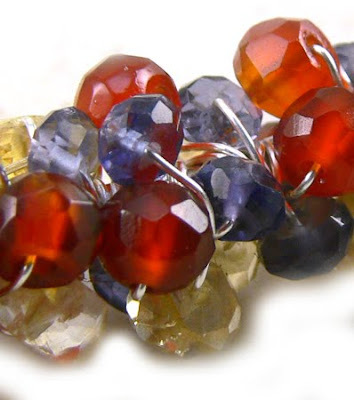 I love how many pieces you got out of these beads and they are delightful! Wooohooooooo! I had a show yesterday, so I am just catching up! Love what you did! Everything looks Amazing!! Great job! The necklace you made is even more gorgeous! I can't decide whether the necklace or the bracelet is my favourite as I love them both for different reasons! The juicy mix of beads in the necklace is gorgeous, but I also love how the beads in the bracelet speak for themselves without any additions. Wow, Lori...looks great! I'm jealous of those beads...it's almost as if you fall into the beads! Hey girl!! Thanks so much for taking the lead on this project again...another fun party. Oh, and I'm with you...those beads are intimidating!! Great job! I especially love the bracelet--it really lets those lampwork shine. Take care! What a fabulous job you did!! 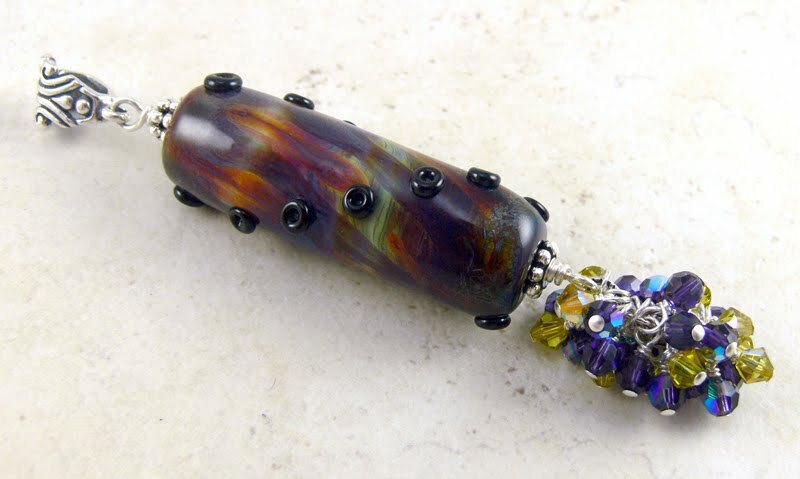 I love how you just draw the eye to the beautiful lampwork bead. The bracelet is just the perfect accompaniment to the necklace!!! Beautiful design, Lori. Love the wire wrapped beads. Thanks for putting these fun events together. What an amazing group of ingredients! You did a beautiful job with both pieces but I especially love the bracelet. Wonderful!! I have been wanting that owl toggle so bad! It goes perfectly with the bracelet you made. The necklaces are just gorgeous! Great job on your bead soup designs and for planning another super fun Bead Soup Party!! Hey Lori, thank you for this great bead soup party. The necklace and the bracelet are gorgeous. The combination of colors is outstanding. Lovely. Thanks so much for hosting. I learned an incredible amount from the whole process of designing with soup beads. All the challenges I set for myself were met, and I could not have done it without your BSP. Your pieces are stunning. 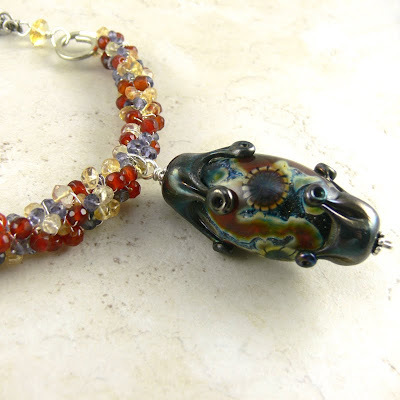 The accent beads in the bracelet so subtly pick up the colors in the lampwork - great arrangement. Wow! Beautiful work with beautiful beads! I love what you did with the toggle from my family. You're brilliant! Hi Lori! What wonderful pieces! Thank you for hosting all of this goodness--I'm enjoying all of the goodies that everyone is revealing! I am in awe! I just love that bracelet. Each piece is very beautiful! Especially the bracelet. Thanks so much for all the time and effort you put into organizing this fun event! !